Welcome to Vegetarian Lifestyle. This is the place to come if you're looking for informative articles, tips about vegetarian cooking, interviews with experts about vegetarian or vegan lifestyles and general info that will help you on your quest to be a healthier, happier YOU! We have posted a few short articles you might find interesting on this page. Many more articles may be found by following the link for Archived Articles. Please let us know if there is any research or information you are interested in seeing here that speak to a vegetarian lifestyle, a vegan lifestyle or a raw food lifestyle. We will do our very best to research it and post our findings. Choosing a vegetarian lifestyle may once have been considered a little over the edge or hippie-ish. Vegetarian or vegan lifestyles were considered to be something that was quirky and not quite main- stream enough. People pictured most vegetarians living in a commune someplace, wearing next to nothing and listening to sitar music all day. While the vegetarian ideal has been around for a long time it didn't really take hold until the mid to late sixties in the U.S. And yes, the hippie culture contributed significantly to that stereotypical view of vegetarians and vegans. But the view, just as the lifestyle itself, has evolved over the years. A vegetarian diet is now considered by most health professionals as a good alternative to an omnivore diet. Plant based diets are just healthier diets. There is plenty of research to indicate that. Of course one has to always remember to consult a physician or nutrition counselor before becoming vegetarian but the key thing to remember is that as long as you maintain a balanced diet - even totally plant based - you will be healthier for it and you will receive all of the nutritional components necessary to stay healthy. So what is a vegetarian or vegan lifestyle and how do you choose to become one or the other? Why do I refer to it as a "lifestyle" anyway? Let's look at the answers to those questions briefly. Basically, a vegetarian diet is largely plant based. There are classifications which dieticians have given vegetarians based on whether or not they eat dairy (lacto), eggs (ovo) or perhaps even fish (pescetarian). And if you go back and forth between largely plant based but occasional meat eating, you are a flexitarian. But I believe the typically accepted vegetarian diet is simply one that excludes meat, fish and poultry. If you take away the eggs and dairy as well as honey, then you are considered to be a vegan which indicates absolutely no animal products whatsoever. Why do people become vegetarian or vegan? There are numerous reasons. Many people adopt a plant-based diet strictly on the basis of reasons of health. Personally, I first became interested because of health. I was running a bit high in my cholesterol numbers (around 240) and after eating a vegetarian diet I have been able to keep my cholesterol in a range of 160 to 190. Many people believe a plant based diet will help them lose weight. And while that is true to some extent - because typically people who eat a plant based diet maintain a leaner body mass - it is not necessarily to be viewed as a weight-loss diet. You can eat a plant based diet and still be overweight. Balance is the key! Many people, especially vegans, are also of the opinion that not only is it not healthy to consume animal products, it is morally unjust as well. In fact, there is a reasonably militant faction of vegans who become rather aggressive about it. We have had some tell us they could not support our site because we are vegetarian and not vegan. I mentioned this elsewhere on the site and I will reiterate it here - we do not judge. While we are animal lovers and respect all life, while we abhor the scourge of factory farming that supplies our food chain, we are also of the opinion that it is a personal matter. What you do is your business and you have you reasons for doing it - it is not my business. We want to educate as much as possible. And of course we want to provide the best recipes we can find or develop to help you on your way to being healthy and whole! Being a vegetarian is definitely a "lifestyle" choice. It will influence how you think about a number of things such as where and what to eat when you travel or go out for an evening. It will influence what you serve when you entertain. It will influence how you think about other sentient lifeforms. You will be fulfilled as well as challenged! That said, we want to provide a couple of links that can give you much more information on becoming a vegetarian and improving your nutrition all the way around. 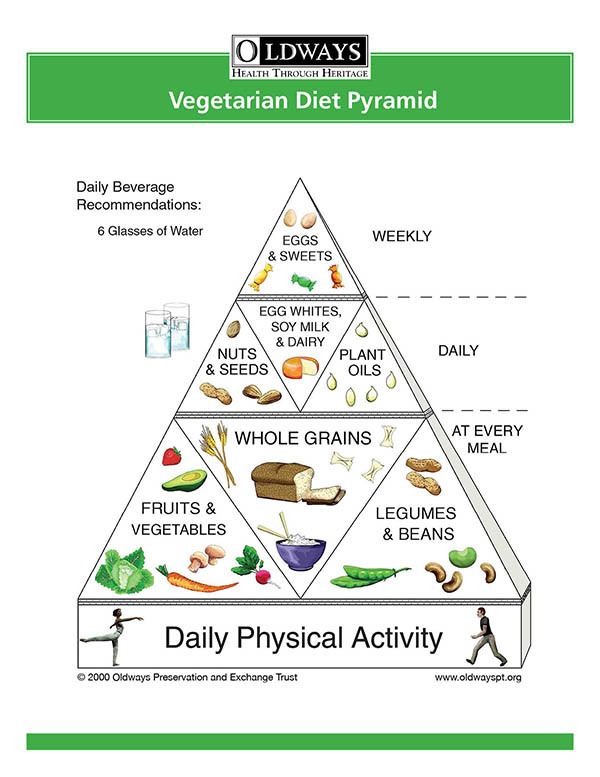 Here is an excellent article form the Mayo Clinic on a healthy vegetarian diet. Another great site for good information and helpful articles is Oldways. One of our favorite resources is the Physicians Committee for Responsible Medicine. They have many great articles, health studies and information as well as terrific vegan recipes. Check them out! And of course, don't forget to download the FREE Vegetarian Starter Kit right here. Simply click on the link or the graphic at the top left column! that carrots were once purple, yellow or white? There were even black carrots! 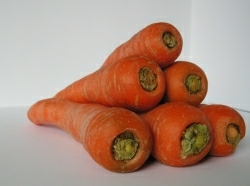 Carrots, at least the domestic kind, are believed to have originated in Afghanistan some 5000 years ago. According to the World Carrot Museum (yes, there is a carrot museum in the UK) domestic carrots were probabably brought west by invading armies and that the carrot more closely related to the one with which we are most familiar (the carotene carrot), developed in or around Turkey. They may have formed as a mutant variety of the purple and yellow carrots. Today, of course, we know them as brilliant orange colored roots with the succulent taste. Cooking softens their crispy texture and allows them to absorb the flavors of other ingredients. What about nutrition? Well there is some interesting research which I will mention in a bit. But first, let's look at what carrots have to offer, generally speaking, in the way of overall nutrition. Carrots are fat free, with no saturated or unsaturated fat. They are low in sodium, high in Vitamin A, cholesterol free and an excellent source of fiber. And of course we know that they are a great source of the antioxidant beta carotene as well, which contributes to fighting cancer and heart disease. As with most fruits and vegetables most of the goodness is actually in, or just below the skin. Combine 1/3 cup extra virgin olive oil, 2 tablespoons of lemon juice, 1/4 teaspoon of minced garlic, 1/4 teaspoon of sea salt and 2 tablespoons of chopped carrot tops. For best results place the garlic and liquid ingredients in a blender and purée at high speed until emulsified. Then add in the salt and carrot tops and purée just until they are finely chopped and still visible in specks in the pale green dressing. Try it on a spinach salad or a celery root salad...just about any green salad. We found it interesting that there has been reserch (again in the UK) that suggests that, unlike most other fruits and veggies, carrots may be actually better for you cooked than they are raw! The difference is pretty negligible but the research does suggest that boiled carrots - and you must boil them before you slice them - are actually better because the body can break down the various nutrients more easily. This is due to the compact cellular nature of the carrots that makes it difficult to extract all the goodness. Therefore, it is implied, that a lot of those good nutrients may be "sloughed off" rather than absorbed as the carrot passes through our digestive systems. As we mentioned before, the difference is almost not even enough to worry about but it is a fact. It is also implied that in order to avoid having to bil before you eat the carrots - or if you really like them raw - then you should consider juicing them or at the very least take care to really chew them very, very well. This will ensure that you get the maximum benefit from the carrot! The boiling thing? Interesting...but we're not sure we buy it! Then again, we like our carrots raw! How about you...eat more carrots! An article by Neal D. Barnard, M.D. Western diets are spreading faster than a grease fire. Between 1995 and 2005, meat consumption rose 16 percent worldwide. In China, the rise was nearly 50 percent. The dairy industry is invading Asia, too, pushing milk, yogurt, and cheese—and all the saturated fat these products hold—in countries where they were once virtually unknown. It is hard to imagine anyone wanting to follow America’s dietary example. The U.S. population now eats, amazingly enough, more than one million animals per hour—well over nine billion per year. Two-thirds of Americans are now overweight or obese, and heart disease, cancer, diabetes, and hypertension are epidemics. Last year, the U.S. Congress had a chance to change things. As federal subsidy programs came up for renewal, Congress debated whether it should end supports for livestock feed, dairy products, and other unhealthy fare. PCRM’s call for basing food policies on health, rather than economic interests, was echoed by the American Medical Association and the American Public Health Association, and the momentum for change was greater than it has ever been. But it was not enough. Congress turned a blind eye to health and cast its lot once again with agribusiness. And agribusiness is going global. Earlier this year, I gave lectures on diet and diabetes in 10 cities in India. In years past, India’s traditional plant-based diet helped keep diabetes at bay. But all that is changing. There is a McDonald’s in the New Delhi airport. Pizza Hut franchises are everywhere. Meaty diets have become trendy and, even among vegetarians, cheesy Western fare has entered the scene. In its wake are telltale chubby waistlines, acne, high blood pressure, and heart disease. And while Chennai’s diabetes prevalence was 8 percent in 1989, it soared to more than 14 percent in 2004 and continues skyward—and the same is true throughout the rest of India. PCRM’s director of diabetes education and care, Caroline Trapp, found the same problem on her recent trip to China as part of a medical delegation. The traditional rice-based diet is fast giving way to meaty meals, and obesity and diabetes are on the rise. The World Health Organization predicts a rise in worldwide diabetes cases from 171 million in 2000 to 366 million in 2030. As the meat and dairy industries enter new markets, the pharmaceutical industry is right behind them, eager to sell expensive treatments for all the diseases caused by bad diets. The key to helping other countries to change is to change ourselves first. Congress must stop pushing unhealthy foods on children at home or on populations overseas. It must acknowledge the scientific consensus that the meaty American diet—including the products that receive federal subsidies—is linked to some forms of cancer and is fueling the epidemics of obesity, heart disease, and hypertension. It is time to stop acting as if animals are simply food ingredients, as if cholesterol is a vitamin, and as if our children are simply a new market for unhealthy foods. Once we change our own food policies and behavior, perhaps we can encourage the rest of the world to follow our healthy example. Reprinted from Good Medicine, Spring 2008, Physicians Committee for Responsible Medicine. Physicians Committee for Responsible Medicine promotes good nutrition, preventive medicine, ethical research practices, and compassionate medical policy. that the avocado has a strange link to a certain portion of the male anatomy? The word 'avocado' comes from the Nahuatl word ahuacatl which is translated as 'testicle', and is an obvious reference to the shape of this fruit. Now, before you go throwing out all of your avocados, read the rest of this short article and find out why avocados are so good for you! It is true that avocados are high in fat. They are also called by the nickname "butter pear" for exactly that reason. As an example, a medium-sized avocado contains about 30 grams of fat. However, nutritionists have taken another look. They've found that most of the fat in an avocado is monounsaturated - that's the "good" kind that actually lowers cholesterol levels. A 1996 study by researchers at the Instituto Mexicano del Seguro Social in Mexico looked at the health benefits of daily avocado consumption. There were 45 volunteers who ate avocados every day for a week. Surprisingly they experienced an average 17% drop in total blood cholesterol. Their cholesterol ratio also changed in a healthy way - their levels of LDL (low-density lipoprotein, or "bad fat") and triglycerides, both associated with heart disease, went down. Their HDL (high-density lipoprotein, or "good fat") levels, which tend to lower the risk of heart disease, climbed. Researchers discovered that avocados are rich in beta- sitosterol, a natural substance shown to significantly lower blood cholesterol levels. 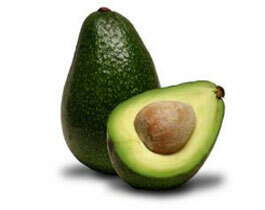 It is also believed that Avocado Oil is the only oil that can adequately penetrate the upper layers of the skin. That would make avocado oil an ideal moisturizing oil ideal to be considered for the drier/mature skin types. Like other "natural oils" these natural basic oils are so much healthier and more biologically aligned to our anatomy than petroleum based emollients. When all is said and done, avocados provide heart-healthy fatand are still a highly nutritious choice when eaten in moderation. However, more important (or at least equally as important) than fat content are calories. One avocado contains roughly 320 calories – more than half the number of calories recommended for an average adult meal. So, instead of spreading butter or cream cheese on your bagel, use some mashed avocado instead. Replace the mayo you'd usually put on a sandwich with a couple of avocado slices. You'll not only save calories, you'll be cutting out saturated fat and increasing your daily intake of monounsaturated fat as well. But before you heap avocado slices or chunks onto every dish, remember that when it comes to calories, avocados have a lot of them, precisely because of all that fat. Fat of any type has about twice the calories of the same amount of carbohydrates. Avocados do add great variety to a well balanced, low-fat diet, but, like everything else, they should be consumed with a degree of moderation.